We offer one weekly and two monthly newsletters covering global, regional and market specific activity. All available newsletters include articles detailing major contract awards, corporate activity and high-profile market industry movements. Our News Publications are part of Wood Mackenzie, a trusted source of commercial intelligence for the world’s natural resources sector. 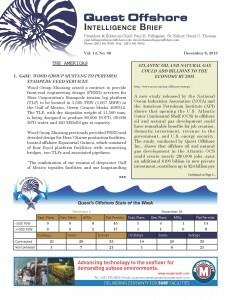 Quest Offshore Intelligence Brief (QOIB) – This globally focused, weekly newsletter provides the reader with a comprehensive understanding of the latest happenings within the deepwater industry. Articles included cover major contract awards, corporate activity and high-profile industry happenings. 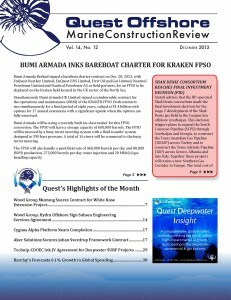 Quest Marine Construction Review (QMCR) – This monthly newsletter focuses on the marine construction market of the offshore oil & gas industry. Readers are kept up-to-speed on the latest supply and demand news concerning the industry’s most sought after installation and construction assets. 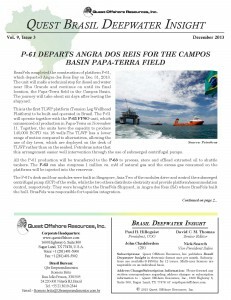 Quest Brazil Deepwater Insight (QBDI) – This monthly newsletter focuses on the deepwater activity offshore Brazil. As a leader in demand for all deepwater equipment and services, it is key to know the latest news from this important region.